Missouri artist Craig Thomas has created all kinds of work throughout his career, including fine art, murals, landscapes and figures. He's perhaps most well-known for his street painting, where he uses the same tools children reach for on sunny days: chalk. Thomas' three-dimensional chalk art has captured audiences throughout the country, but many would be surprised to know he never intended to become a chalk artist. 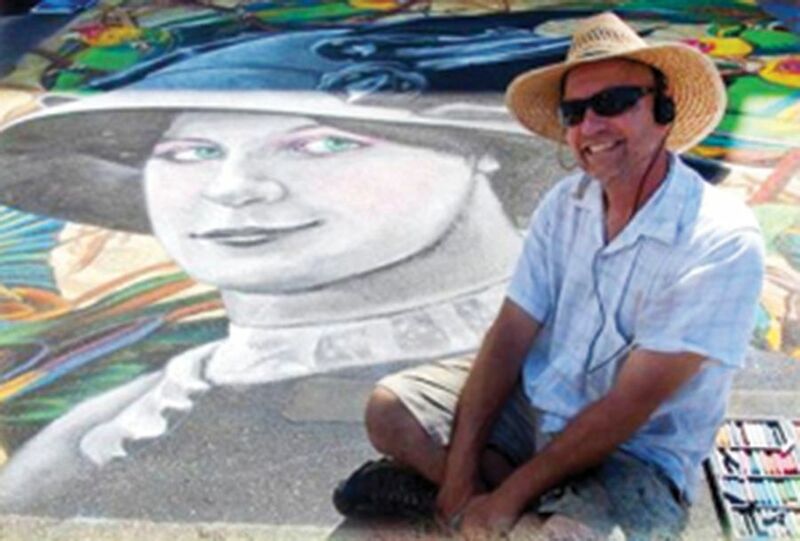 His interest in chalk art began years ago at Riverfest in Cape Girardeau, Mo. Each year, Thomas said, he was asked to do something different on the spot. "There was a working artists area, so we had to be doing something like plein air, airbrushing or portraits," Thomas said. He was inspired to start creating chalk art after remembering a favorite childhood film. In Mary Poppins, Thomas said, there's a scene where everyone jumps into a street painting. "That's where I first saw it," Thomas said. "Of course, over the years you'd see that kind of thing in Europe. I heard about it occasionally, so I thought I'd try that. It turns out it was really popular." 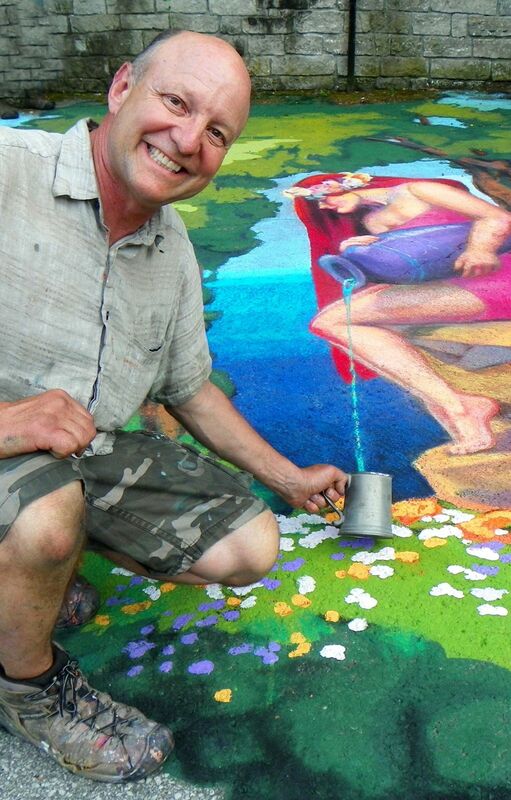 When he creates chalk art, Thomas said, he either recreates a master's artwork on the pavement or comes up with his own three-dimensional piece. He created a three-dimensional piece during last year's May Festival of the Arts. "That's where it looks like you're interacting with it," Thomas said. "The one I did last year was kind of like that. A female figure was pouring water, so you could fill your cup with water. You could interact with it if you wanted to." This year's Chalk Festival is scheduled from May 14-18, and Thomas said he's excited to return to Eureka Springs to make more chalk art. He will be joined by popular chalk artists Joan Finn and Scott Kelly. "This year, I'll probably do another 3D piece," Thomas said. "One artist I enjoy does a lot of allegorical images. Some of them deal with water. I'd kind of like to play off that." Thomas said he's excited to see the festival grow from last year, saying he always enjoys coming to Eureka Springs. When he can make art in a city he loves, Thomas said, that's just icing on the cake. "It was really fun. We had great weather and great people," Thomas said. "I love Eureka Springs. I love the architecture and how the buildings are fitted into the hills and just the character and personality of the town. It's got a really creative vibe." At this year's Chalk Fest, Thomas said, he will have more time to work on his piece. "I know [Kelly's] going to be doing an interactive piece, and mine will probably be interactive as well," Thomas said. "I'll be doing a demonstration if anybody's interested in that. I'll be glad to talk to anybody about it as well." MayFest organizer Sandy Martin said Chalk Fest will last longer this year and will feature workshops for those interested in learning more about creating art on the pavement. "It's expanding, and we're excited about that," Martin said. Thomas said he's been looking forward to Chalk Fest since he was invited to come back. "It's a great honor. I love it. I'm glad to come back," he said. "If anybody needs a guide, I'd be happy to talk to them and help them out. If they want to work a little bit, there will be an area where they can doodle. I'd even be willing to let people help me with mine if they wanted to."